And so DesignerSpray, as it was known back then, was born. That changed to Fashionicide though as I began to delve a little more into the world of fashion, but the blog was acting more like a journal for me. I've always felt like the blog was always for me, something I was doing for myself, for me to learn new, exciting things as I went along. But now, I feel like I'm reaching the end, because one of the greatest things I've learnt over these past 5 years is that it's not about specific colours or tones or shades - except for foundation & concealer - it's about attitude, it's about breaking these pre-conceptions, breaking the mould. Because whether we like it or not, the beauty industry creates stereotypes in their adverts for their target markets. They portray white, black, South East Asian and Subcontinental women within a boring, dull range of 'acceptability' in order to sell more of their stuff. It makes women feel quite limited in what they can buy and use. But it doesn't have to be that way, and that's what I've learnt through Fashionicide. If you look at the range of products available specifically for Asian skin tones, it's still as paltry as ever, if not worse. We're not a priority for the likes of L'Oreal or Rimmel, sure they do make stuff specifically for us, but do Boots or Superdrug stock them in every store? No. For the first few months, maybe even a year, on this blog, I kept myself within that range of what cosmetics companies advertised to me as acceptable for my Asian skin. And whilst I figured out how to use foundation to maximum effect, everything else was a little boring. The watershed moment for me was something as innocuous as a scarlet red lipstick. In a moment of madness I bought it, knowing that I couldn't possibly wear it outside - I'm Asian after all, not white! I took it home, tried it on and loved it, but still I was too shy. Somehow I convinced myself to pluck up the courage and blog about it, photos included. I think that was the moment that Fashionicide was truly born. 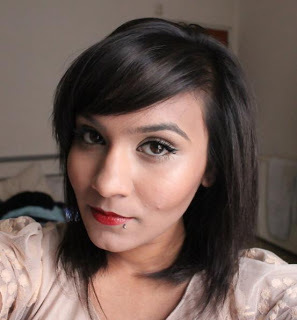 This was when the attitude and confidence began to develop, and from there I went from strength to strength, experimenting with all manner of lipsticks - nudes, reds, oranges, black(! ), purples, blues and so on and so on. Why not? Not only lipsticks though, eyeshadows too. As time wore on, I tried out the entire colour spectrum on my lids, and most of it worked! Smokey eyes were out, bright, bold colours were in. Another of the lessons I've learnt, and quite an important one, is that it doesn't matter too much what makeup brand you use. In the beginning I'd stick almost exclusively to the likes of MAC, Urban Decay, NARS and Benefit - the 'premium' high street brands. There's no doubting the quality of these brands, but I've found that my best looks have been created using cheaper alternatives like Make Up Revolution and Natural Collection. For me, it's not about what you apply, it's about how you apply it. Now I'm in a place where I feel confident with my style, with the make up I use and my skill at applying it. I feel like I can wear anything I want. There are no boundaries or limitations holding me back any longer and now I'm questioning myself - what's the point of Fashionicide? I've not been updating regularly for the past 18 months, I've been busy working on an exciting project which has consumed my life this summer and I can only see it becoming more intense. For now, Fashionicide is alive and well, and I'll still be posting sporadically, but for the time being I'll be evaluating whether or not I can draw any benefit from it. The whole purpose and meaning of the blog from its early beginnings is no longer relevant, and like an ageing Radio 1 DJ, or a long forgotten foundation hiding at the back of the cabinet, its days are numbered. Would hate to see you as I've loved this space so much! But I;m sure your future endeavors are bigger and brighter. Loved reading this in my bath time. That's one thing I've loved about you. Youve evolved and not set boundries with your makeup. Showing others that no matter your complexion its your confidence and attitude that carries the makeup. Not your skintone. Like that whole if you're black you can't wear blue eyeshadow. Says who? I think it's true it really doesn't matter what brand of makeup you use as long as it serves you well. I remember when I started and all the blogs used such high end makeup and it made me feel like that was the only way to go but you can find some great brands for a fraction of the cost and they can be much better than high end at times. Whatever project is in the works it's going to serve you well and continue to be a source of inspiration for yourself and others. Your spirit is an inspiration to anyone who has the pleasure of being around you and I'm thankful I met you through blogging yes it will be an end of era one day but I'm hoping we won't be. I hope this isnt the end of fashionicide but whatever you decide to do with your blog I'm so glad I came across it!! Your posts have been a breath of fresh air and I often show my friends your make up creations haha! good luck on your exciting new project!